After missing what was scheduled to be their first competition due to inclement weather, show choirs Satin ‘n Lace and City Lights gear up for their benefit tonight, Feb. 13, featuring RBHS alumna and 2013 Miss Missouri Shelby Ringdahl. Ringdahl plans to sing with her former choir once again. With their missing competition, show choirs require more practice in hopes of doing well in the season to come. Choir director Mike Pierson goes in with high hopes for the former high-placing shows. 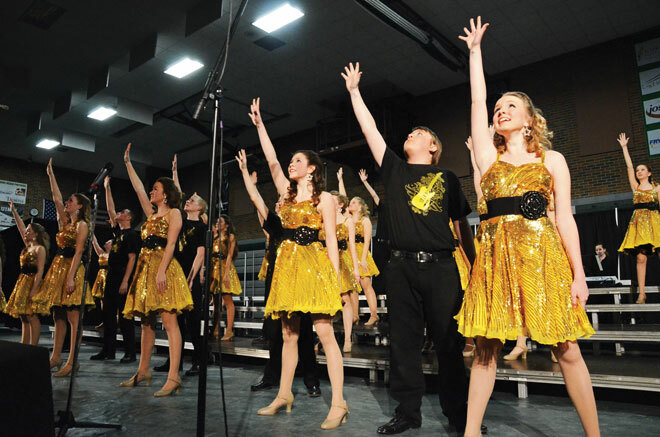 While having a history of success can benefit a program, the weight of keeping the tradition alive falls on the shoulders of returning students like senior Jon Crader, who have high hopes going into this year’s competition field since many of last year’s participants still do show choir this year. Although show choir only attends nationals every other year because of a shared budget between choir and show choir, the motivation for these competitions stay the same. The drive to achieve comes from many sources, whether it be through Pierson, friends or within the singers themselves. To keep his students motivated, Pierson uses various methods to make his show choirs ready for the competitions soon to come. Like any leader, Pierson and his students have unique forms of communication. For senior City Lights member Haley Benson, the possibility of winning Grand Champion at competitions seems obtainable and exciting with this year’s ensemble, even without the motivation of going to as prestigious a competition as Nationals. Have you seen any of the show choir performances? What did you think? Justin Sutherland is usually found reading or socializing with others. Soccer is his hobby and a social experience for him. Justin plans to attend Johnson University to study to be a vocational minister with a bright and non-judgmental personality. Show Choir has always done great and they did amazing at the Carthridge Competition!